The tour departs daily at 11 am from the touristic town Bugibba, with the journey to the Blue Lagoon taking approximately one hour. 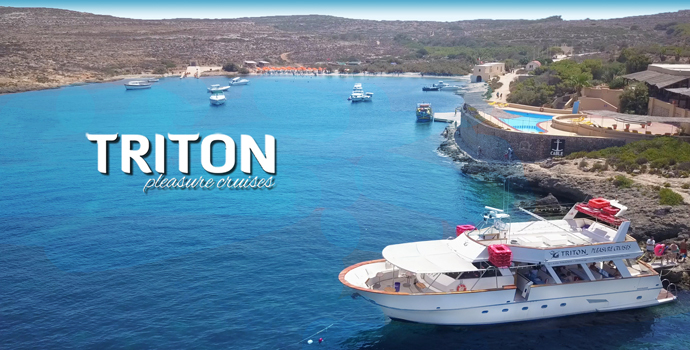 From the open sea you will experience Malta from an beautiful vantage point. Cruising close to the coast, witnessing Malta’s magnificent naturally formed coastline, including its enormous cliffs, rocky nooks and crannies. - Cushioned sun loungers on sundeck. - Shaded open deck with cushions seats and tables. - Swimming platform and swimming ladder to access the sea. - Modern male and female toilets. - Masks and snorkels for hire. - A l carte bar serving hot or cold drinks, and food, Ice-creams or snacks. stopover locations, vessels, departure/arrival times, and ports, as and when required. 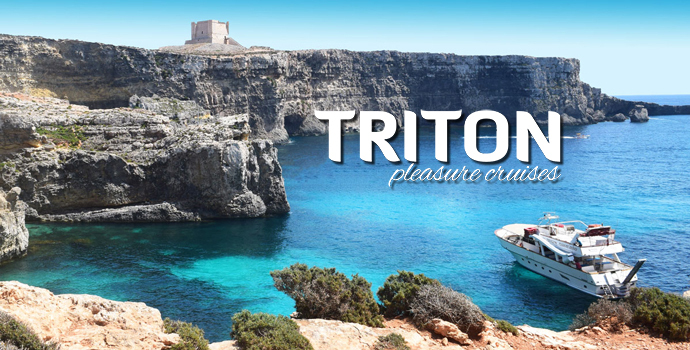 - Once booked and confirmed with Triton Cruises, vouchers are no longer refundable. - Any changes to the booking must be done within 24 hours before departure. - Refunds will not be given if you overstay and miss the boat. - Boarding opens at 09:30, boarding strictly closes at 10:45. - Children 0-4 years are free of charge. - Children 5-10 are child's price. 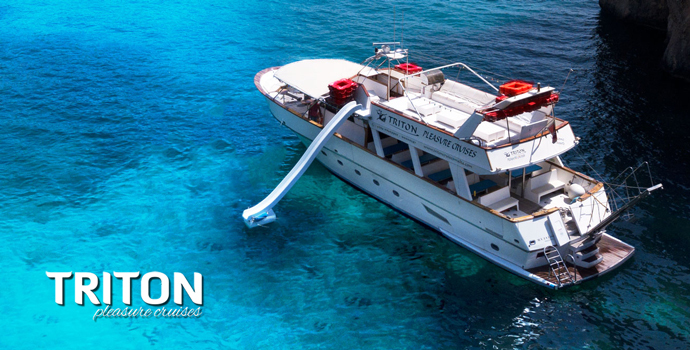 Should you require a refund, please contact Triton Cruises and they will assist you. Limit of 30 deals per person. Valid from 1 May 2019. Expires 30 September 2019. 2. Buy the deal on DealToday and receive your voucher on your e-mail. On route you pass the tiny St. Paul’s Island, viewing the statue of the apostle Saint Paul, rising high into the sky. You will stop and view magnificent sea caves, allowing you the opportunity to take amazing photographs. We continue cruising to the famous Blue Lagoon, where the beautiful crisp turquoise waters are clearer than a swimming pool, definitely not to be missed on a hot summers day. We moor at the Blue Lagoon in a secluded tranquil cove away from the crowds. Relax and sunbathe on the cushioned sun loungers, before slipping into the sea from the upper-deck on the huge water-slide. When the fresh sea air makes you hungry, grab a bite to eat from our a la carte bar, serving juicy hamburgers to freshly made rolls. Then its anchors away as we take a short cruise to the second bonus location of the day, which is ideal for swimmers and snorkelers. The second location is chosen depending on prevailing weather conditions of that day. When the day comes to a close, freshen up in our sweet water showers and slowly take the journey back to port, arriving at 18:00.